This section The first level of subdivision of a “Book” or “Reference Work”.lists the COUNTER Usage Reports; it also specifies the content, format and delivery specifications that these reports must meet to be designated ‘COUNTER-Compliant’. For each compliant product vendors must supply the relevant COUNTER-compliant usage reports at no additional charge to customers. Note: The Usage Reports categorised as Standard in Table 1 above are those reports that vendors must provide (depending on the types of content covered) in order to be COUNTER compliant. Optional reports are not required for COUNTER-compliance, but are designed to enable more detailed usage reporting, where vendors have the capability to do this. Examples are provided below of the COUNTER usage reports, in separate sections for Journals, Databases, Books and Reference Works, and for Multimedia Non-textual media such as images, audio and video.content. While these examples are in Excel format, (See Section The first level of subdivision of a “Book” or “Reference Work”.4.3 below for other report delivery options), primarily for visualisation purposes, all COUNTER usage reports must be available in XML, irrespective of other formats provided. Reports must comply exactly with the formats specified in order to be COUNTER compliant. In all the usage reports listed below the Reporting Period The total time period covered in a usage report.Total column has been moved from the column at right-hand side of the report, which it occupied in previous Releases, to a column on the left-hand side of the monthly data columns. This move has been made to ensure that the Reporting Period The total time period covered in a usage report.Total column is at a fixed place in each report, irrespective of the number of months of data being reported. This facilitates the automated harvesting and processing of the usage reports. Neither books nor book A non-serial publication of any length available in print (in hard or soft covers or in loose-leaf format) or in electronic format. A COUNTER “Data_Type”.series may be included in Journal Report 1.
the ‘Total for all journals’ line is provided at the top of the Table to allow it to be stripped out without disrupting the rest of the Table, as the number of journals included may vary from one month to another. ‘Institutional Identifier’ is an optional field until the standard for this identifier, being developed by the NISO Institutional Identifiers Working Group, is available for implementation. A Journal DOI The “Digital Object Identifier” is a means of persistently identifying a piece of intellectual property (a creation) on a digital network, irrespective of its current location (www.doi.org) “DOIs” may be assigned at the “Title”, “Article”/”Chapter”, or “Component” levelis required for each journal listed. This should be provided simply as an identifier value. (If a Journal DOI The “Digital Object Identifier” is a means of persistently identifying a piece of intellectual property (a creation) on a digital network, irrespective of its current location (www.doi.org) “DOIs” may be assigned at the “Title”, “Article”/”Chapter”, or “Component” levelis not available the cell must be left blank). The Proprietary Identifier A unique identifier given by publishers and other content providers to a product or collection A subset of the content of a service; a collection is a branded group of online information products from one or more content providers that can be subscribed to/licensed and searched as a complete group. For the COUNTER reporting is restricted to pre-set collections that are defined like “Databases”. See “Database”. Note a package or bundle provided by a publisher is not considered a “Database” or “Collection”.of productscolumn must always be included, but cells may be left blank where the vendor See also “Content Provider”. A publisher An organization whose function is to commission, create, collect, validate, host, distribute and trade information online and/or in printed formor other online information provider who delivers licensed content to the customer An individual or organization that can access a specified range of the “Content provider’s” services and/or content and is subject to terms and conditions agreed with the “Content provider”and with whom the customer An individual or organization that can access a specified range of the “Content provider’s” services and/or content and is subject to terms and conditions agreed with the “Content provider”has a contractual relationship.has no Proprietary Identifier A unique identifier given by publishers and other content providers to a product or collection A subset of the content of a service; a collection is a branded group of online information products from one or more content providers that can be subscribed to/licensed and searched as a complete group. For the COUNTER reporting is restricted to pre-set collections that are defined like “Databases”. See “Database”. Note a package or bundle provided by a publisher is not considered a “Database” or “Collection”.of productsfor a journal. The hyphen within the Print and Online ISSNs must be included, as indicated in the example above. Journals for which the number of full-text article The complete text, including all references, figures and tables, of an article, plus links to any supplementary material published with itrequests is zero in every month should be included in Journal Report 1, except where an aggregator A type of vendor that hosts content from multiple publishers, delivers content direct to customers and is paid for this service by customersor gateway An intermediary online service which does not 4 ECO typically host the items requested by the user. The gateway will either refer the user to another site or service to download the item, or will request the item from another site or service and delivers it to the user within its own gateway environment. Items may be cachedis responsible for recording and reporting the usage (see Section The first level of subdivision of a “Book” or “Reference Work”.7 below). The Reporting Period The total time period covered in a usage report.Total will not necessarily be the sum of the Reporting Period The total time period covered in a usage report.HTML and Reporting Period The total time period covered in a usage report.PDF columns, as full-text articles may be available in formats other than PDF Portable Document Format, file formatted for the Adobe Acrobat reader. Items such as full-text articles or journals published in PDF format tend to replicate the printed page in appearanceand HTML. 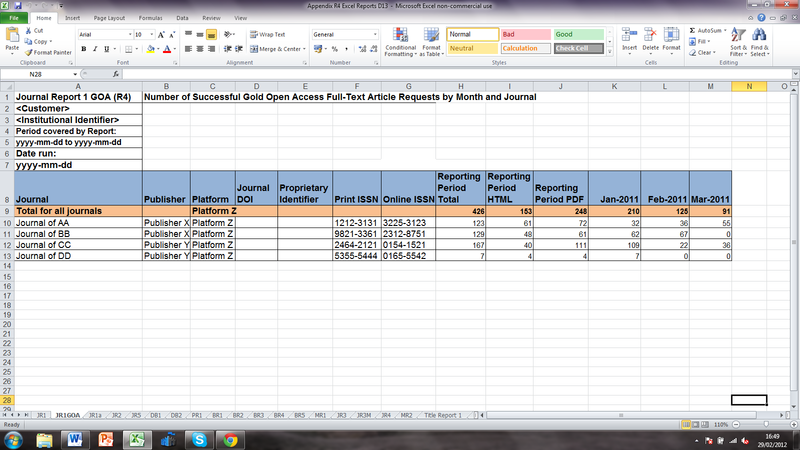 Vendors that provide online journals and books on the same platform An interface from a “Content Provider” that delivers the content to the user A person who accesses the online resourceand that counts and provides the COUNTER usage reports.may report usage of both categories of product in a single optional additional COUNTER report: Title Report 1: Number of successful full-text item requests Number of items requested by users as a result of a user request, action, or search. User requests include viewing, downloading, emailing and printing of items, where this activity can be recorded and controlled by the server rather than the browser. Turnaways will also be counted. (See 3.1.5.4)by month and title. This report may be found in Appendix H to this Code of Practice. Note clarification dated September 2016: Zero reporting is only a requirement in Journal Report 1, the exception being reports from full-text aggregators because of the size of such reports. However, if a platform An interface from a “Content Provider” that delivers the content to the user A person who accesses the online resourceand that counts and provides the COUNTER usage reports.is unable to provide zero usage for entitlements only, they should not include the zero usage. 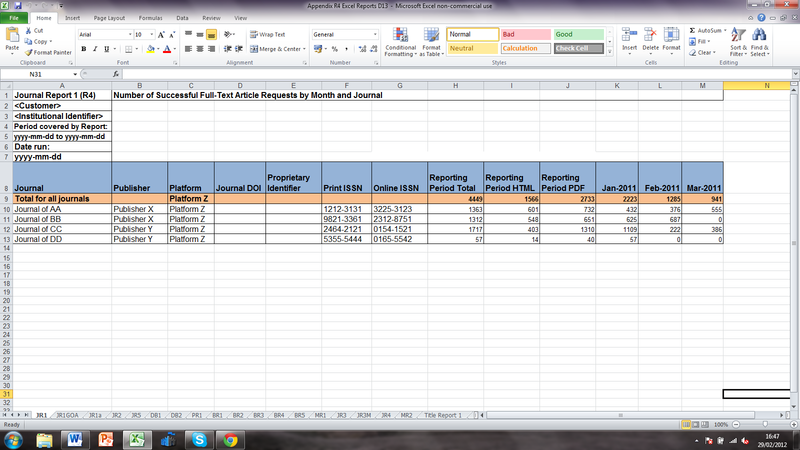 Other reports such as Journal Report 1 GOA and Journal Report 5 are a sub-sets and zero usage should be not reported. Vendors must adhere to the Data Display Rules specified below. While these rules apply specifically to Journal Report 1, they also illustrate the rules that should be followed for the other reports listed in this Code of Practice. Background cell colour is optional for all cells. No cell should contain commas or tab characters. 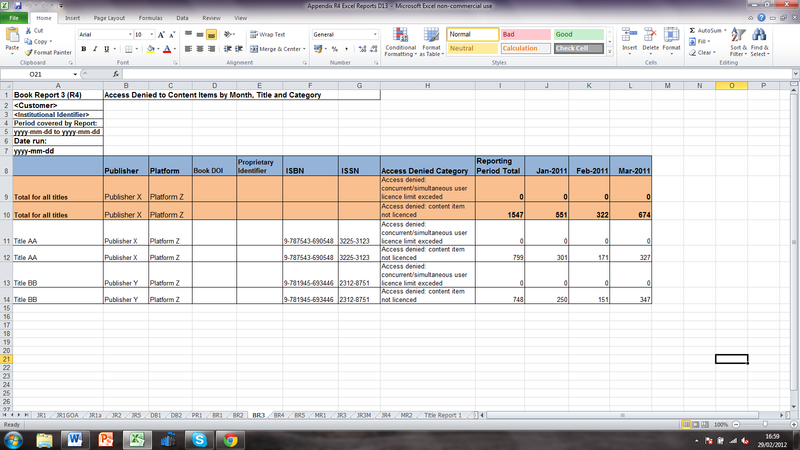 These rules apply to both Excel and TSV (Tab-Separated Value) formats of JR1. The notation used refers to cells using standard Excel notation, with cell “B6” meaning the cell in the second column and at the 6th row. In TSV, this would refer to the 2nd field position on the 6th row of the file. There must be a column for every month that falls within the Reporting Period The total time period covered in a usage report.covered by the report. 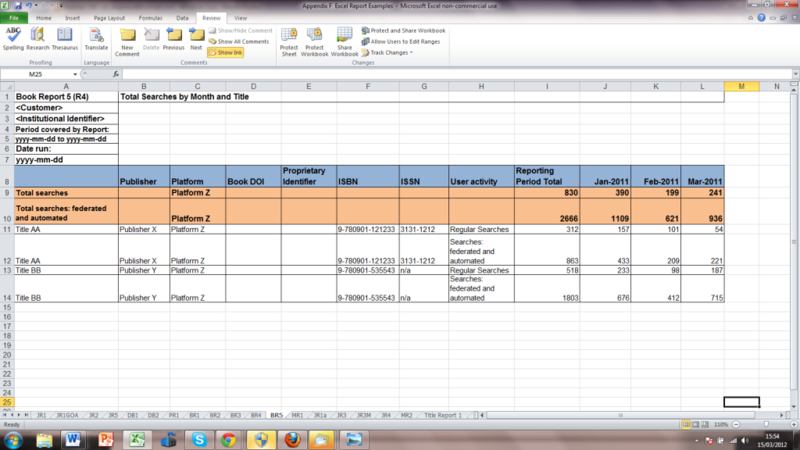 Where recorded usage is zero in a given month ‘0’ must be included in the relevant cells. 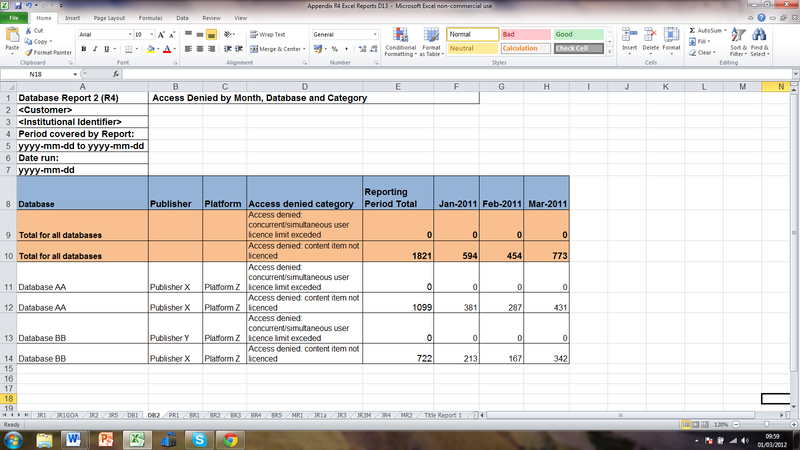 Where usage has not yet been recorded for a given month the relevant cells must be left blank. Cell A5 contains the dates that encompass the Period covered by Report in yyyy-mm-dd format. 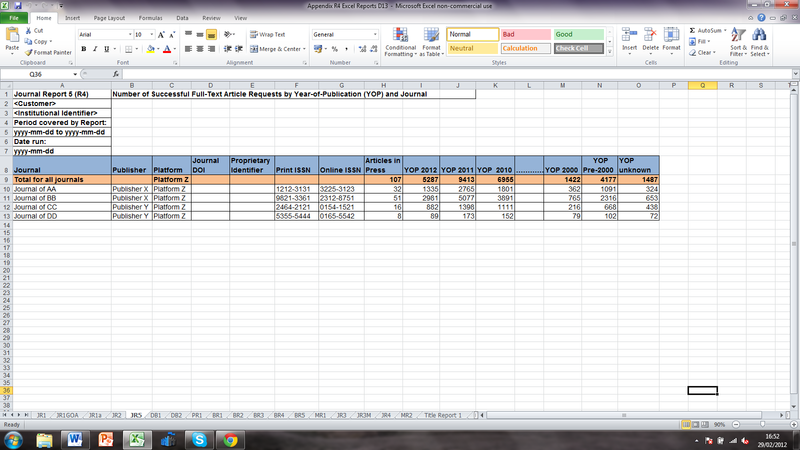 For example a report covering the Period 1 April 2011-30 September 2011 would show 2011-04-01 to 2011-09-30. Cell A7 contains the date that the report was run in yyyy-mm-dd format. For example, a report run on 12 February 2011 would show 2011-02-12. Cell J8 contains the text “Reporting Period PDF”. Cell B9 contains the name of the publisher/vendor, provided all the journals listed in column A are from the same publisher/vendor. If not, this cell is left blank. Cell H10 down to Cell H[n] contains the number of Full Text Requests Total for the Reporting Period – i.e. 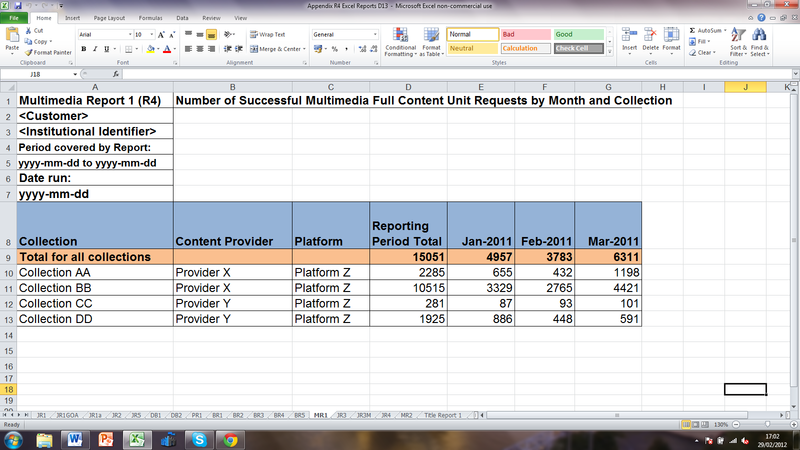 the sum of Full Text Requests Total for Jan, Feb etc. up to and including the last reported month. Cell I10 down to Cell I[n] contains the number of Full Text HTML Article formatted in HTML so as to be readable by a web browser Hypertext Markup Language. A form of text markup readable by web browsersRequests Total for the Reporting Period. Cell J10 down to Cell J[n] contains the number of Full Text Requests PDF Portable Document Format, file formatted for the Adobe Acrobat reader. Items such as full-text articles or journals published in PDF format tend to replicate the printed page in appearancefor the Reporting Period. Cell H9 and Cell K9 across to Cell M7 (or whatever column corresponds to the last column of the table) gives totals for each column. The figure reported in these cells in Row 9 must equal the sum of the cells for that column from Row 10 to the bottom of the table. The sum of (Reporting Period HTML) + (Reporting Period PDF) may give a different total to the (Reporting Period TOTAL) depending on the formats available, because other formats such as PostScript Article formatted in Postscript for faithful output via printermay be included in the (Reporting Period TOTAL) figure, but Publishers/Vendors should NOT include additional columns for these additional formats. Only HTML, PDF and TOTAL are required. The above report complies with the COUNTER Code of Practice for collection A subset of the content of a service; a collection is a branded group of online information products from one or more content providers that can be subscribed to/licensed and searched as a complete group. For the COUNTER reporting is restricted to pre-set collections that are defined like “Databases”. See “Database”. Note a package or bundle provided by a publisher is not considered a “Database” or “Collection”.and reporting of usage data. For definitions of the terms used, See Appendix A. Neither books nor book A non-serial publication of any length available in print (in hard or soft covers or in loose-leaf format) or in electronic format. A COUNTER “Data_Type”.series may be included in Journal Report 1 GOA. ‘Institutional Identifier’ is an optional field until the standard for this identifier being developed by the NISO Institutional Identifiers Working Group is available for implementation. The hyphen within the ISSNs must be included, as indicated in the example above. Vendors that provide online journals and books on the same platform An interface from a “Content Provider” that delivers the content to the user A person who accesses the online resourceand that counts and provides the COUNTER usage reports.may report usage of both categories of product in a single optional additional COUNTER report: Title Report 1: Number of successful full-text item requests Number of items requested by users as a result of a user request, action, or search. User requests include viewing, downloading, emailing and printing of items, where this activity can be recorded and controlled by the server rather than the browser. Turnaways will also be counted. (See 3.1.5.4)by month and title. This report may be found in Appendix G to this Code of Practice. Neither books nor book A non-serial publication of any length available in print (in hard or soft covers or in loose-leaf format) or in electronic format. A COUNTER “Data_Type”.series may be included in Journal Report 2. The hyphen within the ISSNs should be included, as indicated in the example above. 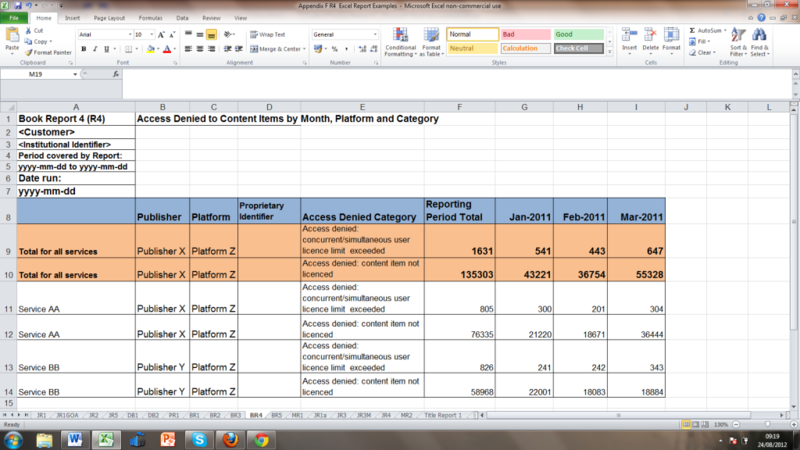 ‘Access denied: content item Collective term for content which is reported at a high level of granularity, e.g. “Full Text Article” (original or a review of other published work); an “Abstract” or digest of a “Full Text Article”; a sectional HTML Article formatted in HTML so as to be readable by a web browser Hypertext Markup Language. A form of text markup readable by web browserspage; supplementary material associated with a “Full Text Article” (e.g. a supplementary data set), or non-textual resources, such as an image, a video, audio, dataset, piece of code, chemical structure or reaction.not licenced’ should be reported when the user A person who accesses the online resourcehas been denied access to a content item Collective term for content which is reported at a high level of granularity, e.g. “Full Text Article” (original or a review of other published work); an “Abstract” or digest of a “Full Text Article”; a sectional HTML Article formatted in HTML so as to be readable by a web browser Hypertext Markup Language. A form of text markup readable by web browserspage; supplementary material associated with a “Full Text Article” (e.g. a supplementary data set), or non-textual resources, such as an image, a video, audio, dataset, piece of code, chemical structure or reaction.because the user A person who accesses the online resourceor the user’s institution The organization for which usage is being reported.does not have access rights under an agreement with the vendor. Examples of the type of event that should trigger the recording of this category of Access Denied An attempt by a user A person who accesses the online resourceto access content that was denied because their institution lacked a proper license or simultaneous user A person who accesses the online resourcelimits specified in the license were exceeded.are: Redirect user A person who accesses the online resourceto another URL (e.g. to a credit card payment page); Return Code 403, Forbidden; Customer error page. Note: Journal Report 1a, Journal Report 3, Journal Report 3 Mobile and Journal Report 4 are optional additional reports that may be found in Appendix H of this Code of Practice. The purpose of this report is to enable customers to distinguish usage of separately acquired archives within the total usage reported in Journal Report 1. The range of years reported in Journal Report 5 must, therefore, enable them to do this. 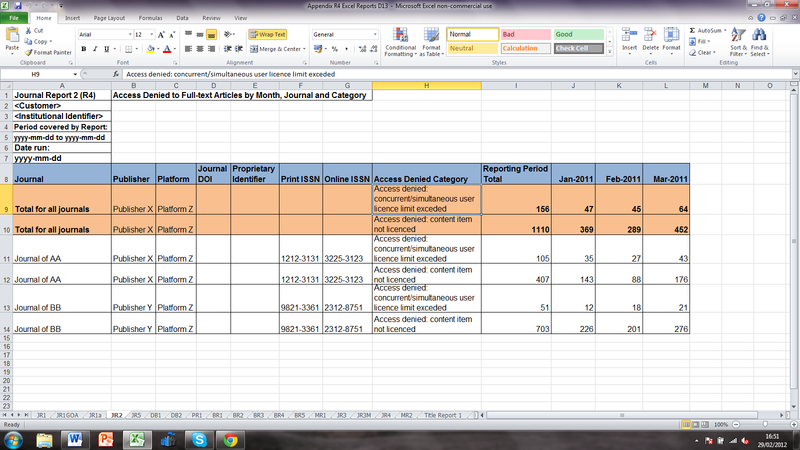 The years and YOP-ranges used in Row 8 of Journal Report 5 may be modified, but vendors must provide each YOP Calendar year in which an “Article”, “Item”, “Issue” or volume Journals: Numbered collection A subset of the content of a service; a collection is a branded group of online information products from one or more content providers that can be subscribed to/licensed and searched as a complete group. For the COUNTER reporting is restricted to pre-set collections that are defined like “Databases”. See “Database”. Note a package or bundle provided by a publisher is not considered a “Database” or “Collection”.of a minimum of one journal issue; in printed form, volumes of more than one issue A collection A subset of the content of a service; a collection is a branded group of online information products from one or more content providers that can be subscribed to/licensed and searched as a complete group. For the COUNTER reporting is restricted to pre-set collections that are defined like “Databases”. See “Database”. Note a package or bundle provided by a publisher is not considered a “Database” or “Collection”.of journal articles associated with each other via allocation of a specific issue number and presented as an identifiable unit online and/or as a physically bound and covered set of numbered pages in printare not normally bound together by the publisher, but are frequently bound together in hardback by the purchasing library to aid preservation of the printed product. Books: Numbered collection A subset of the content of a service; a collection is a branded group of online information products from one or more content providers that can be subscribed to/licensed and searched as a complete group. For the COUNTER reporting is restricted to pre-set collections that are defined like “Databases”. See “Database”. Note a package or bundle provided by a publisher is not considered a “Database” or “Collection”.of articles, chapters, or entries that is part of a larger, multi-volume work, either published together or seriallyis published. For the COUNTER “YOP” attribute, use the year of publication for the print when it differs from the online.in the current decade and in the immediately previous decade as separate columns. All YOPs prior to these two decades may, as a minimum, be reported in a single column unless there is a boundary between current files and backfiles during this period, in which case two columns, one for current files and one for backfiles, must be provided. Vendors are encouraged, where they have the capability to do so, to report all YOPs in separate columns. Vendors are not required to provide Journal Report 5 every month. 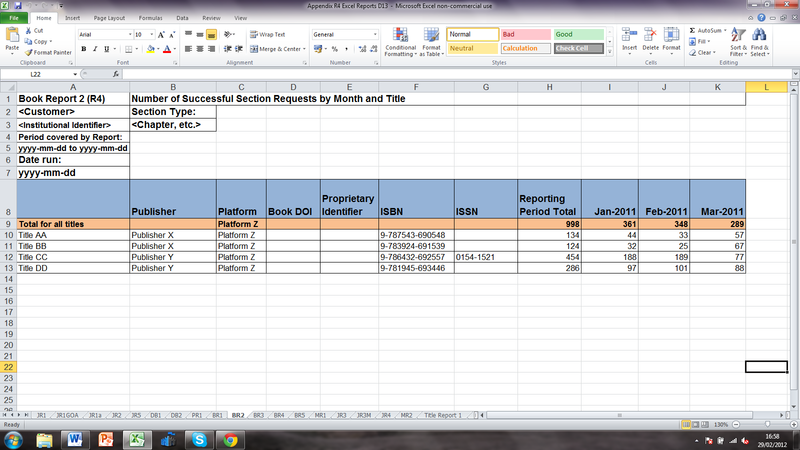 Rather, vendors are required to have the capability to provide Journal Report 5 to customers on demand. Vendors providing Journal Report 5 must also continue to report all usage for journals in Journal Report 1, notwithstanding their inclusion in Journal Report 5. Articles in Press are full-text articles that have been accepted for publication in a journal, and which have been made available online by the publisher, and which will be assigned a publication date An optional field in COUNTER “Item Reports” and “Provider Discovery Reports”. The date of release by the publisher An organization whose function is to commission, create, collect, validate, host, distribute and trade information online and/or in printed formto customers of a “Content Item”.of the current year or a future year. YOP Unknown covers full-text articles (usually older articles) that have been formally published in a journal, but to which no Year of Publication Calendar year in which an “Article”, “Item”, “Issue” or volume Journals: Numbered collection A subset of the content of a service; a collection is a branded group of online information products from one or more content providers that can be subscribed to/licensed and searched as a complete group. For the COUNTER reporting is restricted to pre-set collections that are defined like “Databases”. See “Database”. Note a package or bundle provided by a publisher is not considered a “Database” or “Collection”.of a minimum of one journal issue; in printed form, volumes of more than one issue A collection A subset of the content of a service; a collection is a branded group of online information products from one or more content providers that can be subscribed to/licensed and searched as a complete group. For the COUNTER reporting is restricted to pre-set collections that are defined like “Databases”. See “Database”. Note a package or bundle provided by a publisher is not considered a “Database” or “Collection”.of journal articles associated with each other via allocation of a specific issue number and presented as an identifiable unit online and/or as a physically bound and covered set of numbered pages in printare not normally bound together by the publisher, but are frequently bound together in hardback by the purchasing library to aid preservation of the printed product. Books: Numbered collection A subset of the content of a service; a collection is a branded group of online information products from one or more content providers that can be subscribed to/licensed and searched as a complete group. For the COUNTER reporting is restricted to pre-set collections that are defined like “Databases”. See “Database”. Note a package or bundle provided by a publisher is not considered a “Database” or “Collection”.of articles, chapters, or entries that is part of a larger, multi-volume work, either published together or seriallyis published. For the COUNTER “YOP” attribute, use the year of publication for the print when it differs from the online.has been allocated. This category of articles must not include Articles in Press “Full Text Articles” that have been accepted for publication in a “Journal” and have been made available online to customers, and which will be assigned a publication date of the current year or a future year.unless they cannot be distinguished from other articles without a YOP. ‘Access denied: content item Collective term for content which is reported at a high level of granularity, e.g. “Full Text Article” (original or a review of other published work); an “Abstract” or digest of a “Full Text Article”; a sectional HTML Article formatted in HTML so as to be readable by a web browser Hypertext Markup Language. A form of text markup readable by web browserspage; supplementary material associated with a “Full Text Article” (e.g. a supplementary data set), or non-textual resources, such as an image, a video, audio, dataset, piece of code, chemical structure or reaction.not licenced’ should be reported when the user A person who accesses the online resourcehas been denied access to a content item Collective term for content which is reported at a high level of granularity, e.g. “Full Text Article” (original or a review of other published work); an “Abstract” or digest of a “Full Text Article”; a sectional HTML Article formatted in HTML so as to be readable by a web browser Hypertext Markup Language. A form of text markup readable by web browserspage; supplementary material associated with a “Full Text Article” (e.g. a supplementary data set), or non-textual resources, such as an image, a video, audio, dataset, piece of code, chemical structure or reaction.because the user A person who accesses the online resourceor the user’s institution The organization for which usage is being reported.does not have access rights under an agreement with the vendor. Examples of the type of event that should trigger the recording of this category of Access Denied An attempt by a user A person who accesses the online resourceto access content that was denied because their institution lacked a proper license or simultaneous user A person who accesses the online resourcelimits specified in the license were exceeded.are: Return Code 403, Forbidden; Redirect user A person who accesses the online resourceto another URL; Customer error page. A Book DOI The “Digital Object Identifier” is a means of persistently identifying a piece of intellectual property (a creation) on a digital network, irrespective of its current location (www.doi.org) “DOIs” may be assigned at the “Title”, “Article”/”Chapter”, or “Component” levelis required for every title on the list. This should be provided simply as an identifier value. (If a Book DOI The “Digital Object Identifier” is a means of persistently identifying a piece of intellectual property (a creation) on a digital network, irrespective of its current location (www.doi.org) “DOIs” may be assigned at the “Title”, “Article”/”Chapter”, or “Component” levelis not available the cell must be left blank). The ‘Total for all titles’ line is provided at the top of the Table to allow it to be stripped out without disrupting the rest of the Table, as the number of books included may vary from one month to another. Books for which the number of title requests is zero in every month should not be included in Book A non-serial publication of any length available in print (in hard or soft covers or in loose-leaf format) or in electronic format. A COUNTER “Data_Type”.Report 1. **The Section The first level of subdivision of a “Book” or “Reference Work”.Type (Chapter, encyclopaedia entry, etc.) used in this report must be indicated in the report itself as shown. Where more than one type of Section The first level of subdivision of a “Book” or “Reference Work”.is used, simply list the predominant type covered in this report. The ‘Total for all titles’ line is provided at the top of the Table to allow it to be stripped out without disrupting the rest of the Table, as the number of titles included may vary from one month to another. Books for which the number of Section The first level of subdivision of a “Book” or “Reference Work”.requests is zero in every month should not be included in Book A non-serial publication of any length available in print (in hard or soft covers or in loose-leaf format) or in electronic format. A COUNTER “Data_Type”.Report 2. Book Report 3 is only to be supplied for those titles where turnaways are at the title level. In most cases turnaways are at the level of the platform, in which case Book A non-serial publication of any length available in print (in hard or soft covers or in loose-leaf format) or in electronic format. A COUNTER “Data_Type”.Report 4 applies. A Book DOI The “Digital Object Identifier” is a means of persistently identifying a piece of intellectual property (a creation) on a digital network, irrespective of its current location (www.doi.org) “DOIs” may be assigned at the “Title”, “Article”/”Chapter”, or “Component” levelis required for every title on the list. This should be provided simply as an identifier value. (If a Title DOI The “Digital Object Identifier” is a means of persistently identifying a piece of intellectual property (a creation) on a digital network, irrespective of its current location (www.doi.org) “DOIs” may be assigned at the “Title”, “Article”/”Chapter”, or “Component” levelis not available the cell must be left blank). The Proprietary Identifier A unique identifier given by publishers and other content providers to a product or collection A subset of the content of a service; a collection is a branded group of online information products from one or more content providers that can be subscribed to/licensed and searched as a complete group. For the COUNTER reporting is restricted to pre-set collections that are defined like “Databases”. See “Database”. Note a package or bundle provided by a publisher is not considered a “Database” or “Collection”.of productscolumn must be included, but cells may be left blank where the vendor See also “Content Provider”. A publisher An organization whose function is to commission, create, collect, validate, host, distribute and trade information online and/or in printed formor other online information provider who delivers licensed content to the customer An individual or organization that can access a specified range of the “Content provider’s” services and/or content and is subject to terms and conditions agreed with the “Content provider”and with whom the customer An individual or organization that can access a specified range of the “Content provider’s” services and/or content and is subject to terms and conditions agreed with the “Content provider”has a contractual relationship.has no Proprietary Identifier A unique identifier given by publishers and other content providers to a product or collection A subset of the content of a service; a collection is a branded group of online information products from one or more content providers that can be subscribed to/licensed and searched as a complete group. For the COUNTER reporting is restricted to pre-set collections that are defined like “Databases”. See “Database”. Note a package or bundle provided by a publisher is not considered a “Database” or “Collection”.of productsfor a title. The above report complies with the COUNTER Code of Practice for collection A subset of the content of a service; a collection is a branded group of online information products from one or more content providers that can be subscribed to/licensed and searched as a complete group. For the COUNTER reporting is restricted to pre-set collections that are defined like “Databases”. See “Database”. Note a package or bundle provided by a publisher is not considered a “Database” or “Collection”.and reporting of usage data. For definitions of the above terms, see Appendix A. 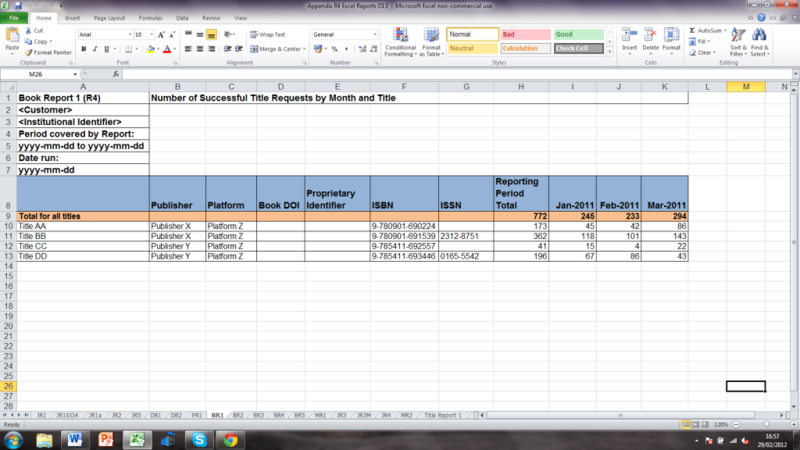 Book Report 5 is to be supplied only for those titles where searches and sessions can be counted at the title level. In most cases searches and sessions are at the level of the platform, in which case Platform An interface from a “Content Provider” that delivers the content to the user A person who accesses the online resourceand that counts and provides the COUNTER usage reports.Report 1 applies. Usage of multimedia Non-textual media such as images, audio and video.content (audio, image, video, etc.) where this is a content item Collective term for content which is reported at a high level of granularity, e.g. “Full Text Article” (original or a review of other published work); an “Abstract” or digest of a “Full Text Article”; a sectional HTML Article formatted in HTML so as to be readable by a web browser Hypertext Markup Language. A form of text markup readable by web browserspage; supplementary material associated with a “Full Text Article” (e.g. a supplementary data set), or non-textual resources, such as an image, a video, audio, dataset, piece of code, chemical structure or reaction.in itself (i.e. not part of a Journal, Book or Reference Work) should be reported in Multimedia Non-textual media such as images, audio and video.Report 1, below. Multimedia Report 1 is required only for products that consist of collections of multimedia Non-textual media such as images, audio and video.items (audio, video, images). Where multimedia Non-textual media such as images, audio and video.content is published within a journal or book, its usage should be reported in the appropriate COUNTER Journal or Book A non-serial publication of any length available in print (in hard or soft covers or in loose-leaf format) or in electronic format. A COUNTER “Data_Type”.reports. If a product has been acquired by a library consortium, the vendor See also “Content Provider”. A publisher An organization whose function is to commission, create, collect, validate, host, distribute and trade information online and/or in printed formor other online information provider who delivers licensed content to the customer An individual or organization that can access a specified range of the “Content provider’s” services and/or content and is subject to terms and conditions agreed with the “Content provider”and with whom the customer An individual or organization that can access a specified range of the “Content provider’s” services and/or content and is subject to terms and conditions agreed with the “Content provider”has a contractual relationship.must (unless the resulting reports are unmanageably large in size, in which case the SUSHI An international standard (Z39-93) that describes a method for automating the harvesting of reports. COUNTER_SUSHI is an implementation of this standard for harvesting COUNTER reports. COUNTER compliance requires “Content Providers” to implement COUNTER_SUSHI.Harvester tool, described in Section The first level of subdivision of a “Book” or “Reference Work”.4.1.6 below, is an alternative approach) provide a readily accessible single usage report for the consortium A group of institutions joining together to license content.that includes details for each member of the consortium. This report must contain only the consortium A group of institutions joining together to license content.members (and no extraneous institutions outside the consortium). The vendor See also “Content Provider”. A publisher An organization whose function is to commission, create, collect, validate, host, distribute and trade information online and/or in printed formor other online information provider who delivers licensed content to the customer An individual or organization that can access a specified range of the “Content provider’s” services and/or content and is subject to terms and conditions agreed with the “Content provider”and with whom the customer An individual or organization that can access a specified range of the “Content provider’s” services and/or content and is subject to terms and conditions agreed with the “Content provider”has a contractual relationship.must also provide to the consortium A group of institutions joining together to license content.individual reports for each consortium member An institution that has obtained access to online information resources as part of a consortium. A consortium A group of institutions joining together to license content.member is defined by a subset of the Consortium’s range of IP addresses or by other specific authentication details.or institute (unless forbidden to do so by contract with a consortium member An institution that has obtained access to online information resources as part of a consortium. A consortium A group of institutions joining together to license content.member is defined by a subset of the Consortium’s range of IP addresses or by other specific authentication details.or institute). In consortia where more than one member institution The organization for which usage is being reported.may share an IP address, or range of IP addresses, the total usage statistics reported in the consolidated Consortium A group of institutions joining together to license content.Reports 1,2 and 3 below, must be de-duplicated. This means that, in such cases, the total usage reported may be less than the sum of the usage reported for each member institution. Consortium Report 1: Number of successful full-text journal article An item of original written work published in a “Journal”, other serial publication, or in a “Book”. An “Article” is complete, but usually cites other relevant published works in its list of “References”, if it has one. A COUNTER “Data_Type” used to identify and filter usage of content defined as “Articles”.or book chapter A subdivision of a “Book” or of some categories of “Reference Work”; usually numbered and titled. 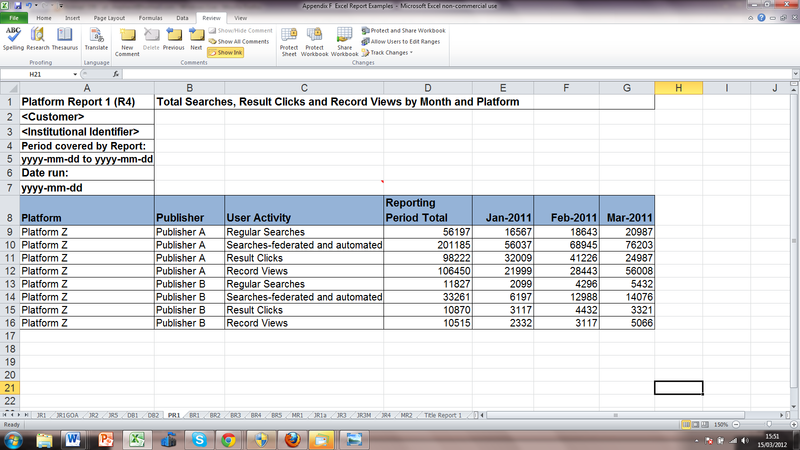 A COUNTER “Section_Type”.requests by month and title, (XML only). This report is a single XML file, broken down by consortium A group of institutions joining together to license content.member, which contains the full-text usage data for every online journal and book A non-serial publication of any length available in print (in hard or soft covers or in loose-leaf format) or in electronic format. A COUNTER “Data_Type”.taken by individual consortium A group of institutions joining together to license content.members, calculated on the same basis as in Journal Report 1 and in Book A non-serial publication of any length available in print (in hard or soft covers or in loose-leaf format) or in electronic format. A COUNTER “Data_Type”.Reports 1 and 2, using the data processing rules specified in Section The first level of subdivision of a “Book” or “Reference Work”.5 below. Consortium Report 2: Total searches by month and database (XML only). 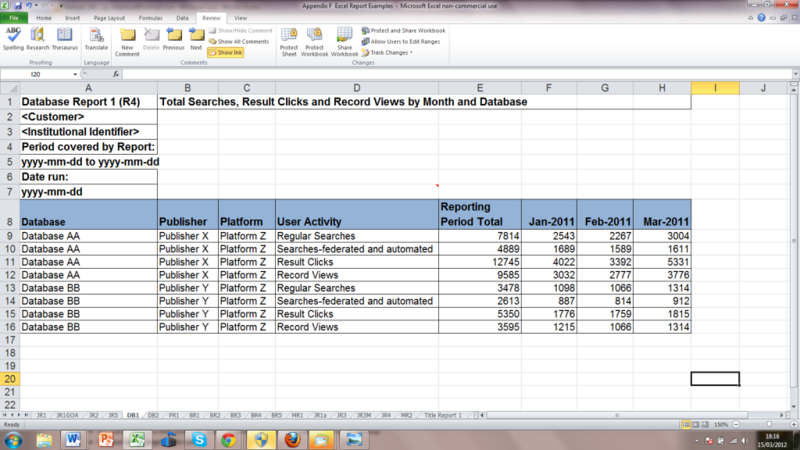 This report is a single XML file, broken down by consortium A group of institutions joining together to license content.member, which contains the search, record view and result click Report the number of times that users click on results from a given database from the result list displayed by a search or browse action on that platform.The Result Click is counted irrespective of whether it takes the user to an internal record within the database searched (e.g. Full Text or an abstract/detailed display), or to an external resource (e.g. an OpenURL link such as “findit@mylibrary”, a document delivery form)counts for each database taken by individual consortium A group of institutions joining together to license content.members, calculated on the same basis as for Database Report 1, above, using the data processing rules specified in Section The first level of subdivision of a “Book” or “Reference Work”.5 below. This report is a single XML file, broken down by consortium A group of institutions joining together to license content.member, which contains the usage data for multimedia Non-textual media such as images, audio and video.full content units in collections taken by individual consortium A group of institutions joining together to license content.members, calculated on the same basis as in Multimedia Non-textual media such as images, audio and video.Report 1, using the data processing rules specified in Section The first level of subdivision of a “Book” or “Reference Work”.5 below. The XML schema covering the above usage reports is available on the NISO/SUSHI website (http://www.niso.org/schemas/sushi). This schema can be used with the SUSHI An international standard (Z39-93) that describes a method for automating the harvesting of reports. COUNTER_SUSHI is an implementation of this standard for harvesting COUNTER reports. COUNTER compliance requires “Content Providers” to implement COUNTER_SUSHI.and COUNTER_SUSHI schemas to retrieve any of the COUNTER reports (journals, databases, books, reference works, consortium). The flexibility of the schema is achieved through the use of several self-defining elements. Rather than enumerate the allowed values within the schema, these values are defined outside of the schema to allow new reports and metrics to be added without needing to update the schema each time. The values for the “Report” data element are listed in the Report Registry (http://www.niso.org/workrooms/sushi/reports/ ). Values for other elements can be found on the COUNTER Schema Data Element Values webpage (http://www.niso.org/workrooms/sushi/values/ ) . Where journal articles and book A non-serial publication of any length available in print (in hard or soft covers or in loose-leaf format) or in electronic format. A COUNTER “Data_Type”.chapters are available on the same platform, usage should be included in the same consortium A group of institutions joining together to license content.report. Where journal articles and book A non-serial publication of any length available in print (in hard or soft covers or in loose-leaf format) or in electronic format. A COUNTER “Data_Type”.chapters are available on separate platforms usage should be reported separately. also be used to batch download the other COUNTER usage reports). COUNTER leaves it to vendors and their customers to decide between them which approach ( the Consortium A group of institutions joining together to license content.Reports or SUSHI An international standard (Z39-93) that describes a method for automating the harvesting of reports. COUNTER_SUSHI is an implementation of this standard for harvesting COUNTER reports. COUNTER compliance requires “Content Providers” to implement COUNTER_SUSHI.Harvester) is appropriate for a particular customer. Customer accounts, access and entitlements to vendor See also “Content Provider”. A publisher An organization whose function is to commission, create, collect, validate, host, distribute and trade information online and/or in printed formor other online information provider who delivers licensed content to the customer An individual or organization that can access a specified range of the “Content provider’s” services and/or content and is subject to terms and conditions agreed with the “Content provider”and with whom the customer An individual or organization that can access a specified range of the “Content provider’s” services and/or content and is subject to terms and conditions agreed with the “Content provider”has a contractual relationship.sites are authenticated in a number of different ways, but most commonly by IP addresses or by username/password. The vendor See also “Content Provider”. A publisher An organization whose function is to commission, create, collect, validate, host, distribute and trade information online and/or in printed formor other online information provider who delivers licensed content to the customer An individual or organization that can access a specified range of the “Content provider’s” services and/or content and is subject to terms and conditions agreed with the “Content provider”and with whom the customer An individual or organization that can access a specified range of the “Content provider’s” services and/or content and is subject to terms and conditions agreed with the “Content provider”has a contractual relationship.must provide COUNTER usage reports at different levels, in line with the level at which the vendor See also “Content Provider”. A publisher An organization whose function is to commission, create, collect, validate, host, distribute and trade information online and/or in printed formor other online information provider who delivers licensed content to the customer An individual or organization that can access a specified range of the “Content provider’s” services and/or content and is subject to terms and conditions agreed with the “Content provider”and with whom the customer An individual or organization that can access a specified range of the “Content provider’s” services and/or content and is subject to terms and conditions agreed with the “Content provider”has a contractual relationship.holds the account on its system. For example, if a vendor See also “Content Provider”. A publisher An organization whose function is to commission, create, collect, validate, host, distribute and trade information online and/or in printed formor other online information provider who delivers licensed content to the customer An individual or organization that can access a specified range of the “Content provider’s” services and/or content and is subject to terms and conditions agreed with the “Content provider”and with whom the customer An individual or organization that can access a specified range of the “Content provider’s” services and/or content and is subject to terms and conditions agreed with the “Content provider”has a contractual relationship.treats a university business school as an entity with a separate customer An individual or organization that can access a specified range of the “Content provider’s” services and/or content and is subject to terms and conditions agreed with the “Content provider”ID, which can be identified by, for example, unique IP addresses distinguishable from the full range of university IP addresses, then reports must be delivered at the business school level. – Microsoft Excel file (see Section The first level of subdivision of a “Book” or “Reference Work”.4.1 above), or as a Tab Separated Value (TSV) file or other structured text file that can be easily imported into Microsoft Excel and other spreadsheet programmes without loss or corruption of data. Microsoft Excel files may be offered in addition to text files. Reports should be made available on a password-controlled website (accompanied by an optional email alert when data is updated). For consortium A group of institutions joining together to license content.usage reports the consortium A group of institutions joining together to license content.administrator must be able to access both the consolidated consortium A group of institutions joining together to license content.level usage statistics and the usage statistics for individual consortium member An institution that has obtained access to online information resources as part of a consortium. A consortium A group of institutions joining together to license content.member is defined by a subset of the Consortium’s range of IP addresses or by other specific authentication details.institutions, from a single login, using the same user A person who accesses the online resourceid and password (i.e. without having to log out and back in for each individual institution). The reports must allow the customer An individual or organization that can access a specified range of the “Content provider’s” services and/or content and is subject to terms and conditions agreed with the “Content provider”the flexibility to specify a date range, in terms of months, within the most recent 24 month period. Where no date range is specified, the default shall be calendar year and calendar-year-to-date reports for the current year. XML versions of the reports must be available for harvesting via the SUSHI An international standard (Z39-93) that describes a method for automating the harvesting of reports. COUNTER_SUSHI is an implementation of this standard for harvesting COUNTER reports. COUNTER compliance requires “Content Providers” to implement COUNTER_SUSHI.protocol within 4 weeks of the end of the reporting period. Usage statistics reported in the COUNTER reports must be consistent and not dependent on the browsers used by customers. As a minimum vendors must support current versions, compliant with World Wide Web Consortium (WC3) standards, of the following web browsers: Google Chrome, Internet Explorer and Mozilla Firefox.